Chuck Ragan, lead singer of Hot Water Music, sat down with The Chicago Ambassador’s Bob Chiarito backstage at Riot Fest after putting on an electric set. Ragan, no stranger to hard work, had arrived in Chicago the night before with his wife and son and met his bandmates for a crash-practice before their Riot Fest gig, and their late show at The Cobra Lounge. Ragan talked about that, their new album which contains a subtle shout-out to legendary Chicago band Pegboy, who he credits as perhaps saving his life when he was younger; and fly fishing, the industry he works in as a guide and boat captain when he’s not playing with Hot Water Music or working on his solo music career. 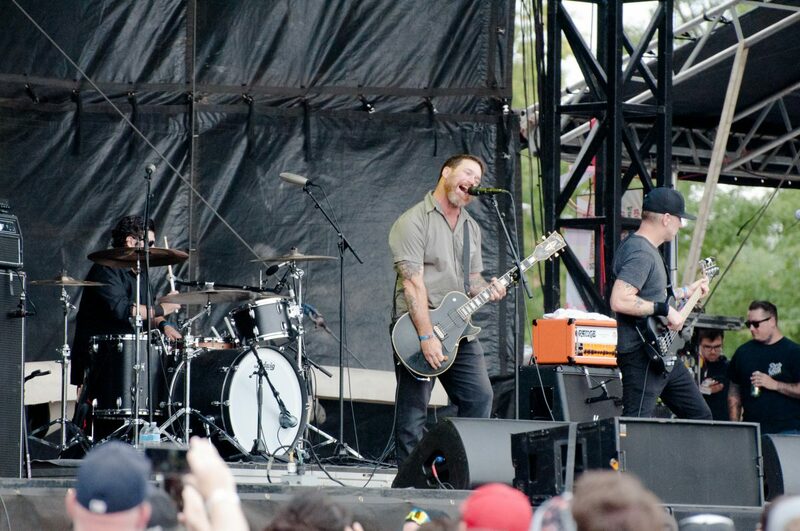 Chuck Ragan and Hot Water Music at Riot Fest. Photo by Gina Kapernekas. CA) I heard a rumor that you guys had a crash practice at CJ Heimberger’s, member of The Spanish Flats, practice space last night. RAGAN) Yeah. Late last night. We just ran through a few songs. It was pretty cool. CA) Was it because the hurricane [Irma] screwed you guys up? A couple of your guys live in Florida, right? RAGAN) We hadn’t practiced and wanted to run through it a couple times. We were going to rehearse in Florida but then the hurricane rolled through. CA) Did the hurricane effect your guys at all? RAGAN) Yeah, for sure. All the houses were ok, no major flooding but their power was out for days and days. CA) You live in [Grass Valley] California where there are big wildfires going on. Have you been effected by those? RAGAN) Yeah, for sure. I live in fire country. We are right there. CA) So your band has experienced both extremes recently. At least now you’re safe in the midwest. RAGAN) It kinda goes with the theme of the band, fire and water. CA) The new album just came out. Obviously you’re probably excited about that. Is it also a relief? RAGAN) It’s always a relief to get a record out. For us, music has been such a major form of therapy. For us, when you release a song, when you physically stamp that into hot wax and release that, there is a sense of closure. Especially when the songs are connected to you. You’re attached to them and by releasing them it’s almost like — the same thing when you write something. I used to write out my frustrations, write out my aggressions on paper and then burn them. That was a really important thing. It’s like cutting loose to the world. Releasing a record is like the same thing. CA) Your family is here with you? RAGAN) Yeah, my wife and boy are here. CA) That’s great. Is it rare that they are able to travel to one of your gigs? CA) What made you bring them? RAGAN) Oh man, my son loves Hot Water Music. He’s only 2 but my wife plays it and he flips out. To me it’s important for him to know where we come from and know what we do. This is special event. We have people here that we’ve known and been in contact with for the last two decades. For me to introduce my son to people that have been in my life is great. CA) You mentioned the Mighty Mighty Bosstones and I’m sorry if I’m making you miss them [They were onstage during our interview], but who else are you excited about seeing? RAGAN) I’m probably not going to be able to see anyone. We can hear the Bosstones now and they sound great. My wife wants to see Jawbreaker tonight with a bunch of our good friends. I love Jawbreaker, I’ve played with them. I may just pull daddy duty during that set and watch our boy. We have over 60 friends here from California for Riot Fest. 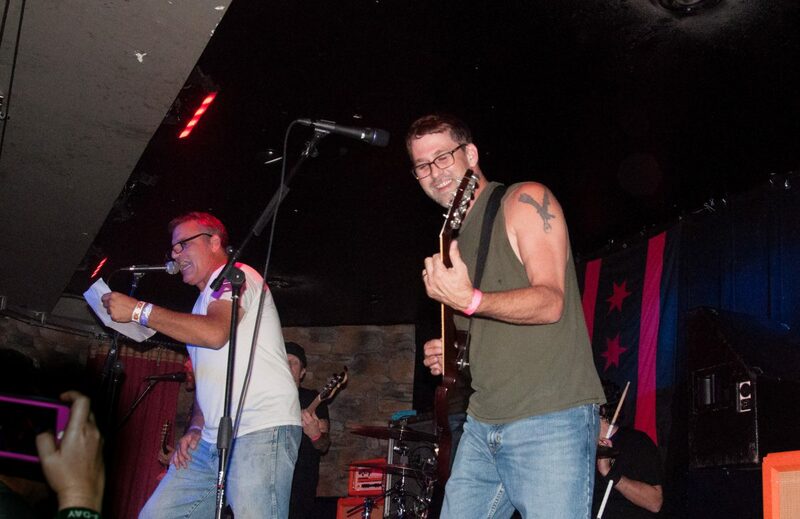 Pegboy’s Larry Damore (left) with Chris Wollard of Hot Water Music at The Cobra Lounge. Damore joined Hot Water Music onstage to sing Never Going Back, the band’s tribute to Pegboy’s Strong Reaction. Photo by Gina Kapernekas. CA) Did you know that Larry Damore from Pegboy was in the crowd during your set? RAGAN) I had no idea. We put him on the list but we didn’t talk to him beforehand. RAGAN) [Laughing] That’s crazy to me. It’s kind of funny how worlds collide. I’m a fly fishing guy and he’s way into fly fishing. He’s an expert rod builder. It’s just so funny how for years we followed them and admired them. Pegboy was huge to us. Then years later here he is building a custom rod in the same industry that I’m in. In a lot of ways the fly fishing community is how the punk scene used to be. You have the world and the industry of fly fishing which is very similar to the world and the industry of punk music. To me it’s really similar. CA) Supporting each other and the whole DIY thing? RAGAN) Yeah. It’s more intimate, not as wide-spread. It’s pretty cool. CA) That’s great. The song starts out “Had a strong reaction waking up, it took a lot of reacting to get up.” That’s a homage to Pegboy’s Strong Reaction. RAGAN) Totally. It’s kind of a pretty heavy song. When I was a kid I wasn’t always so positive. I really dove into the dark side for many years. Shoot man, I’ll be honest with you. I was suicidal. I didn’t care whether I lived or died. I was a runaway from home for a little bit. And I had a wonderful home, great parents. It wasn’t that I came from a broken home, I’m not playing that card at all. I just rebelled. My parents were religious and I didn’t like what they were pushing. CA) So was it bands like Pegboy that may have saved you? RAGAN) Definitely. There was a ton of music growing up. Strong Reaction hit me like a ton of bricks. All of us come from crazy music backgrounds but there were certain bands that we all gravitated to, like Pegboy. See our Riot Fest 2017 recap here! To read our previous interview with Chuck from May 2017, click here.